A ray of light has two colors at the extremes. Colors are not colors when these two are taken out of the stream. Colors are meaningless but we gave them meanings. Different cultures, different religions have different level of importance to these colors. The only common are two colors. Black and White. Almost everywhere White signifies peace and good whereas Black signifies evil or bad. Though common significance these two “colors” plays important role in many countries. Somewhere in an unknown place in this world two piglets are born from the same mother. It is unusual as most of the times the number is more than two. One of them was Black and other was White. White was very proud of his color and always teased Black for his color. The aggressive nature of Black always resulted in fights. Their mother was now unable to handle the childrens. She always wanted both of them to stay together. Not just stay together, but happily stay together. One day a quick brown fox jumps over the fence and starts searching for his lunch. Just then his eyes catch the piglets. There was a dog house with a jammed door but there was no dog. Hence “the lazy dog” doesn’t come in picture. Effort by only one was not enough to open the door. They dash the door together. Door opens where they hide safely. That fox goes away with empty hands. Now both the pigs realize their mistake. They hug and live happily together. 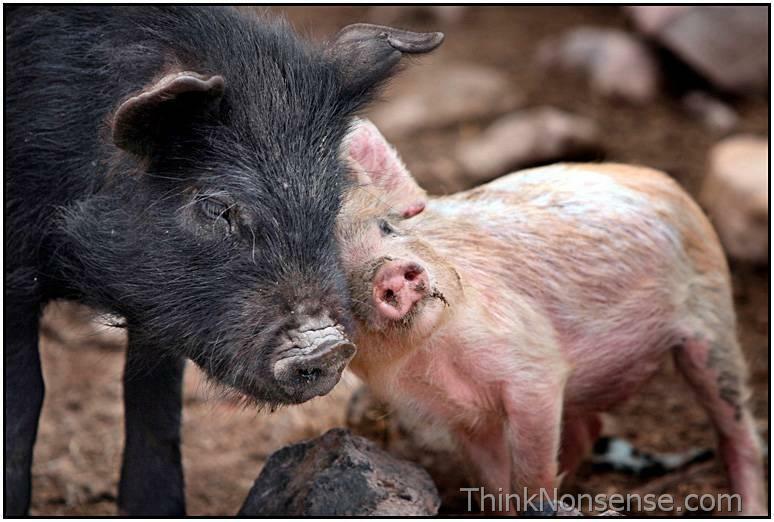 When these pigs can understand, why not us? Why we differentiate people based on color or race? We all know we are childrens of god, the same parent. So why we fight? I am called Black or colored in White countries. In India I am called Hindu. In Hindu community I am called a Brahmin. And then again in Brahmin I am a Dravid Brahmin. Why this differentiation? Why so much blood based on race, color or religion. Which religion tells you to do so? On the verge of upcoming elections in US I thought of writing this. There is lot of publicity for candidates. There is this media stressing on White and Black. There will be peoples doing the same. Is it the color which you will vote for? Please not this. Judge the candidate based on his intelligence and what he can do for the country. He will be one of the most influencing person for the next four years around the world. A lot will depend on him for the progress and betterment of this world. Choose him wisely. Trust your heart and not the eyes.